The massive oil spill off the Gulf Coast has left a bitter taste in our mouths, and for good reason–how could this happen at the same time that the environmental movement is finally rallying popular support? But all is not lost, according to a new report from the U.S. Energy Information Administration. 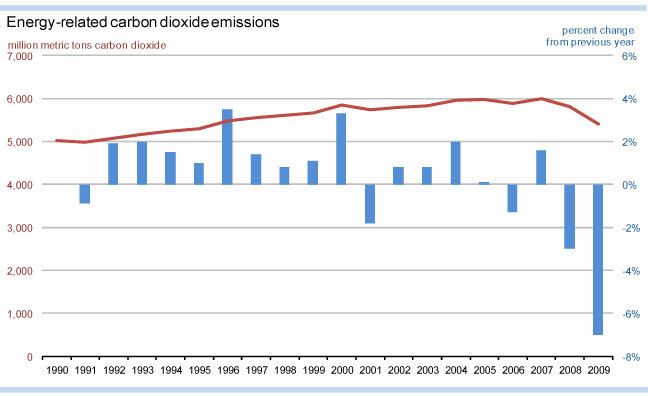 The U.S. managed to slash carbon emissions by a record 7% in 2009–a drop of 405 million metric tons. That’s the biggest percentage decline since emissions data collection began in 1949. Some of the decline can be attributed to the economic downturn. This is worrying, as Andrew Revkin points out in the New York Times, because different parts of the economy change at different rates. That means we need to pay attention to the possibility, for example, that customers of coal-burning utilities were hit harder by the recession than other citizens. 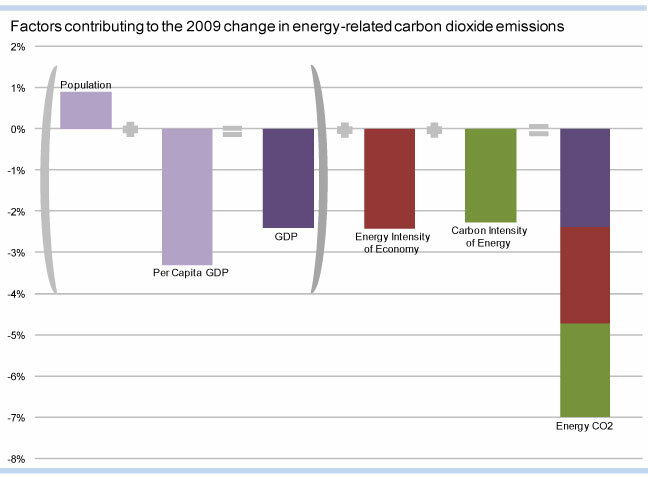 But the recession is far from the only contributing factor to the emissions decline. Even though economic activity dropped 2.4% last year, the population increased 0.9%. One of the biggest factors in the CO2 drop: a 4.3% drop in the carbon intensity of the energy sector due to increased use of renewables and natural gas production efficiency improvements. Better vehicle fuel efficiency also played a part. So hey, our push toward efficiency and clean energy might actually be working! It’s a start.